Preheat the oven to 350°F. Place pie shell on cookie sheet. Set aside. In a non-stick skillet over medium high heat, cook the sausage until no pink remains. Add the green onion and cook for 1 minute longer. Drain excess fat from pan. 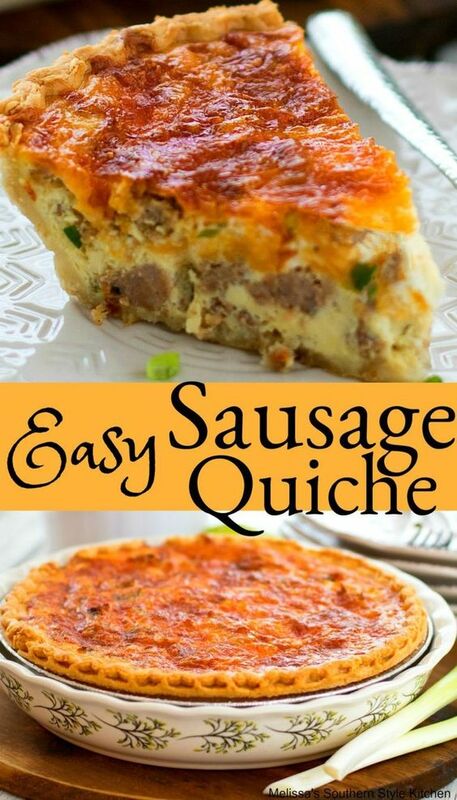 Spread 1/2 sausage mixture in pie shell ad sprinkle with 1/2 cheese. Spread remaining sausage over cheese. In a medium size mixing bowl whisk together the half and half, eggs, salt, pepper,and mustard. Add a few dashes hot sauce, if desired. Pour evenly over sausage. Sprinkle with remaining cheese. Place into oven and bake for 45-50 minutes or until the center is set when gently shaken. Check at 30 minutes and lay a piece of aluminum foil on top to prevent over browning if needed. Allow to rest for 30 minutes. Serve warm.